Plus Size Kitten: SWAP WATCH: Finally got my Lush Karma & Honey I wash the Kids Soap! 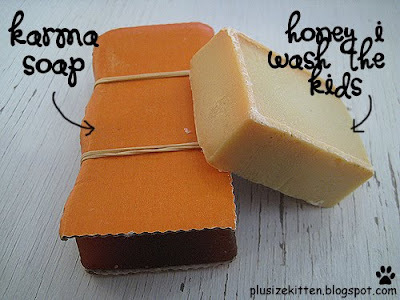 SWAP WATCH: Finally got my Lush Karma & Honey I wash the Kids Soap! Recently I swapped with my silent reader Faffy for his Lush Soaps with my Stila Brush No.1 (I'm an awesome swapper haha). MUAHHAHA I finally got my hands on them yummy soaps. The soap smells so STRONG. It's coming from Karma SOAP! very strong herbalish spa like smell (my bf will kill me, he hates all this beauty stuffs scents) Honey I wash the kids has a nice honey-butter-ish scent. They look different from what's displayed at the Lush website (my mom says they look ugly at the shop, I told my mom that's why people want to buy them) I'm so in love with Lush! I can't wait to try the soaps! The number one, undisputed best-selling Lush soap for washing you, the kids, the dog and the granny! Even when you know you’ve got a big chunk of this waiting for you in your own bathroom, the minute you step into a Lush shop the mouthwatering smell draws you towards it and makes you pick up a piece, breathe in its sticky toffee and honey scent and take it to the counter to be wrapped. The honey water, aloe vera and sweet orange oil soothe and sweetly scent your hands and body so it feels even better than it smells. Our Karma is not just a fragrance; it's more of a life choice. It looks like a bar of solid amber; each precious jewel is generously scented with our signature fragrance. Many people fall for its sultry charms when they wash their hands with it in someone else’s bathroom and are drawn further along the path to karma enlightenment. Keep it by the basin in soap form to scent the bathroom and give you a top up of Karma scent whenever you need a boost of creative thought - or whenever you need to get your hands clean. First up, what a chic new layout! Bwahahaa obviously I havent visited your lovely blog for weeks. Aiyoh too busy with (boring) workloads! I bet that "Honey..." soap is heavently, coz I just lurve honey-scented stuffs! so nice :) hehe.. swapped for it. babe, where ada sprees for Lush? hope d soaps r working well 4 ya. so, have anything new 4 sale lately miu??? The Karma Soap smells so strong! I had to hide it away coz my bf don't like the smell. My drawer is filled with the scent of spa-like herb smell haha. The Honey I wash the kids smells deliciously yummy. Hanna: hahah thanks thanks! we're all busy :( even i dun have time to update my blog.. (lagi lagi no time read ppl's blog). I can't wait to see ur swap from Dee (is it Dee swappin with u?!) I wish i could get swaps with someone from US too! it's so totally awesome.. but would the postage kill?? Kitty: lowyat forum ada.. but :( sprees are not my thing.. so i duwan spree haha..
going to HK on monday. let me know if you want more LUSH! you have my email! or is it cheaper from Australia? Fatin: LOL?! what's the secret code here! Personally I prefer doing international CPs and multi-swaps, coz everybody knows just how absurdly overpriced everything is in Malaysia.